I'm wondering if smaller natural gas leaks, or hydrocarbons are visible with diy infrared techniques. a new natural gas pipeline is planned a couple miles from where we live. We can't see methane because visible light passes right through it. DIY infrared cameras based on consumer cameras can't detect methane because near infrared light also passes right through it. Methane absorbs longer wavelengths of infrared light, so cameras sensitive to those wavelengths can see methane. I don't know of any DIY techniques to detect those wavelengths. Modified consumer cameras can be sensitive to wavelengths between 380 nm and 1000 nm (0.38 to 1.00 µ). Methane absorbs in two bands near 3311 nm and 7692 nm (3.31 µ to 7.69 µ). 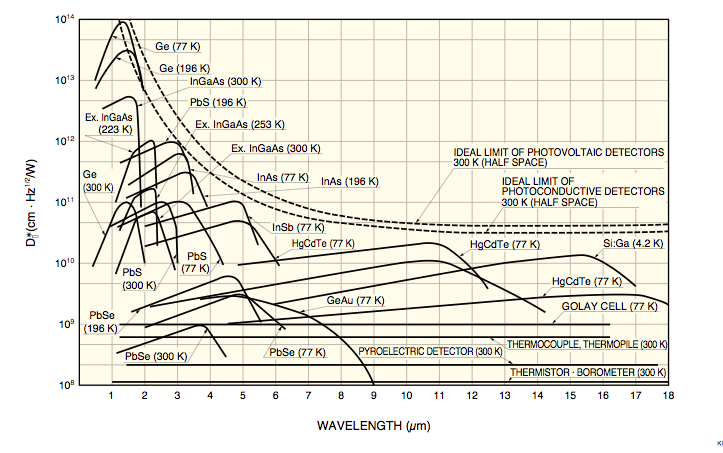 Absorption spectrum of methane. Vertical scale is percent absorption. DIY infrared cameras are sensitive to light between 0.38 µ and 1.0 µ. @marlokeno It's not cheap (although it's $100 than it used to be, mmm) but it sure is DIY and within the larger amateur budget. That's excellent. Maybe a good order of magnitude cheaper than a FLIR camera. There seems to be a typo in the description of the IR range covered in those two links. The first says "LWIR sensor, wavelength 8 to 14 μm" and the second says "900 to 14,000 nanometers." I don't which is right, but I think only the second range covers both methane absorption bands? Oh well, it's a good piece of kit for thermal applications anyway. FLIR is looking in a narrow band-- 3200-3400nm -- where these hydrocarbons are most absorptive. @geraldmc pointed out that there are weaker absorbances around 2300nm and 1650nm, bands that might be cheaper to detect infrared in. I explored historic single-sensor scanning concepts in the research note, but they were all full-field 2D image scanning. I think a one-line-of-pixels-at-a-time "slit scan" system could be built in a nominally DIY way (I still think it would be $1000+ in parts). A one-line slit scan system mounted on an aircraft flying in a straight line (to generate a 2D image) would be the lowest-difficulty "DIY" gasfinder, I think. I screen-capped this graph of different sensors and their sensitivities and put it in this comment, the original link is dead. Has anyone had any luck in experimenting with this? Is this a project that would be doable?